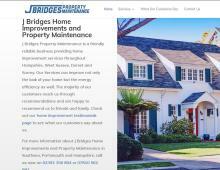 J Bridges Property Maintenance offer property maintenance in Southsea, Portsmouth and throughout popular residential areas in Hampshire. They have an experienced team of window fitters, carpenters and builders that can help you with your home improvement project. From emergency double glazing repairs and planned property maintenance to composite doors and conservatories, J Bridges Property Maintenance can help. They have a highly skilled workforce with vast experience in providing home improvement services in Portsmouth & Southsea. Contact J Bridges Property Maintenance today for a home improvement quotation.